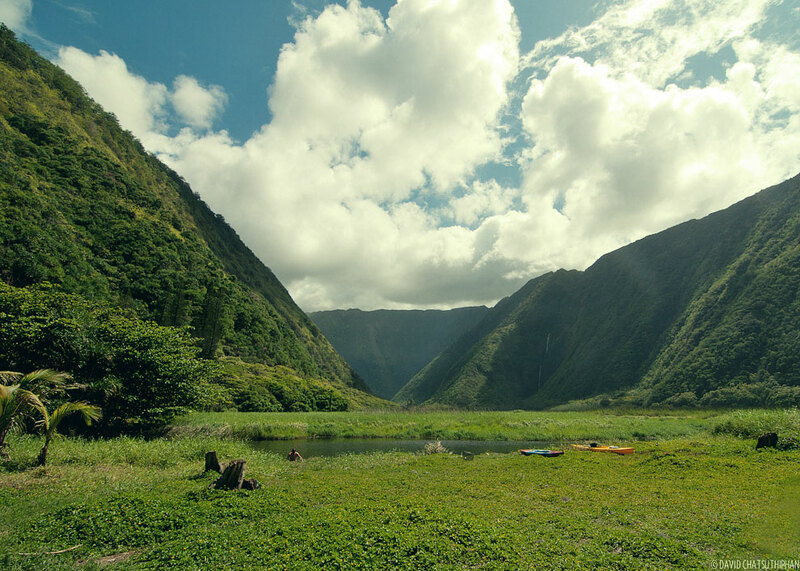 This is Waimanu Valley. 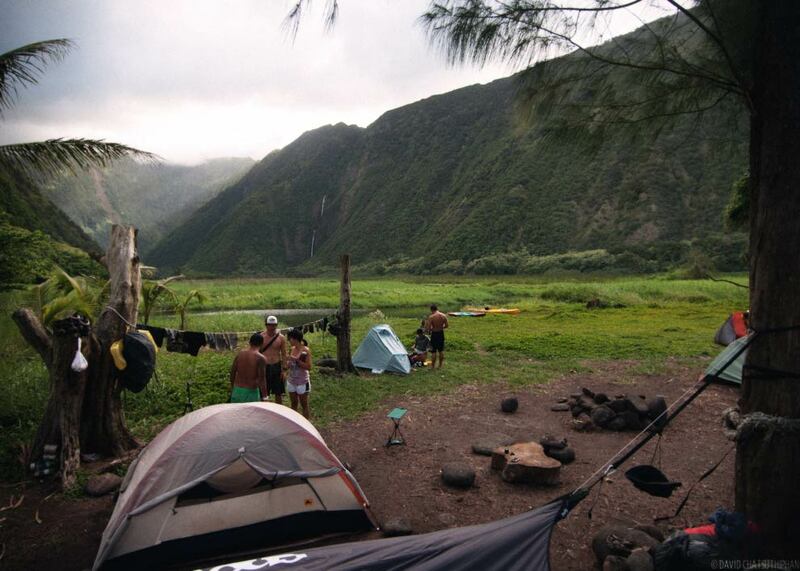 A lesser known camping spot on the Hamakua Coast of Hawaii’s Big Island. It’s another one of those magical places where you can get away and have an adventure. Shortly after returning from a backpacking trip to Kalalau (which involved hiking 22 miles along the Na Pali Coast of Kauai), I get Facebook message from Kaleo Lancaster. 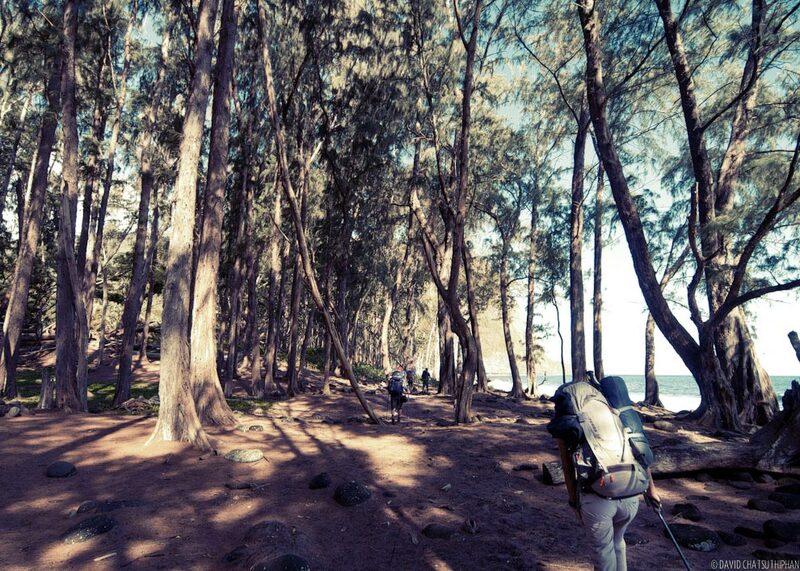 And it’s about a backpacking trip involving hiking 18 miles along the northern coast of the Big Island. He’s got a permit and there’s a bunch of open spaces available. 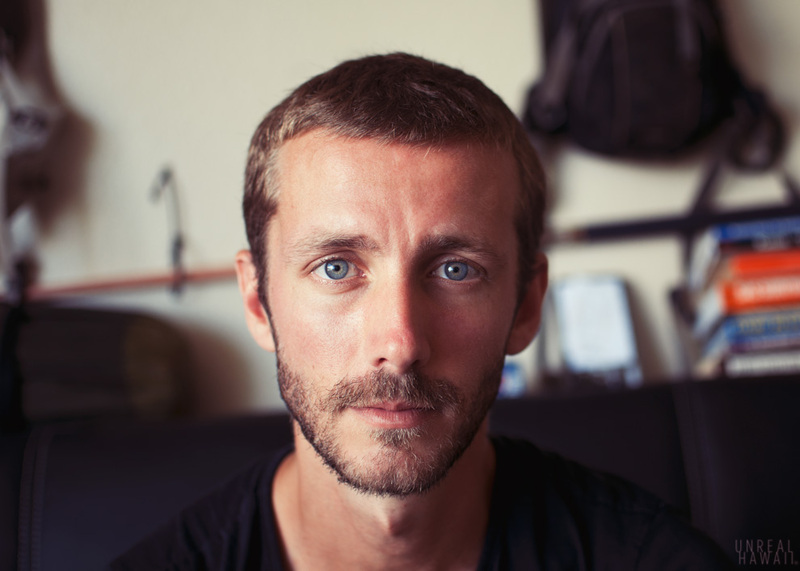 Now, I didn’t know Kaleo personally at the time but as you may know, I’m a huge fan of his blog Island Trails. And in fact, it was his blog that got me into hiking. Getting a message from him was pretty cool but, I had just done Kalalau less than two weeks ago. My knees were still recovering, I was still enjoying the feel of sleeping in my bed, still loving the feeling of pooping like a modern human (on a toilet, in a bathroom) and hiking was pretty much the last thing on my mind. While this would be a great opportunity to meet a fellow hiker/blogger, I was just not in the mood to rough it. So, what to do? The answer was obvious. It was time to chat with Cory. And so we went. 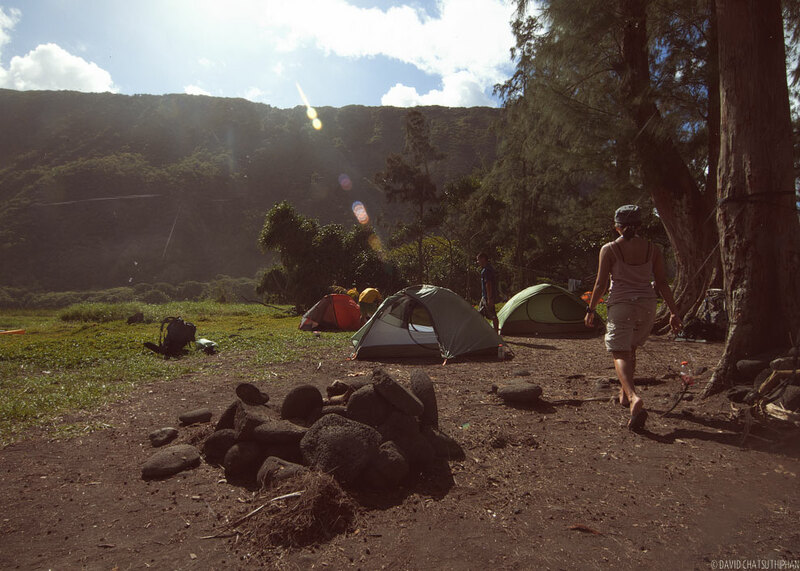 I figured that while I was still recovering from the Kalalau trip, in a few weeks I would be ready to backpack again. 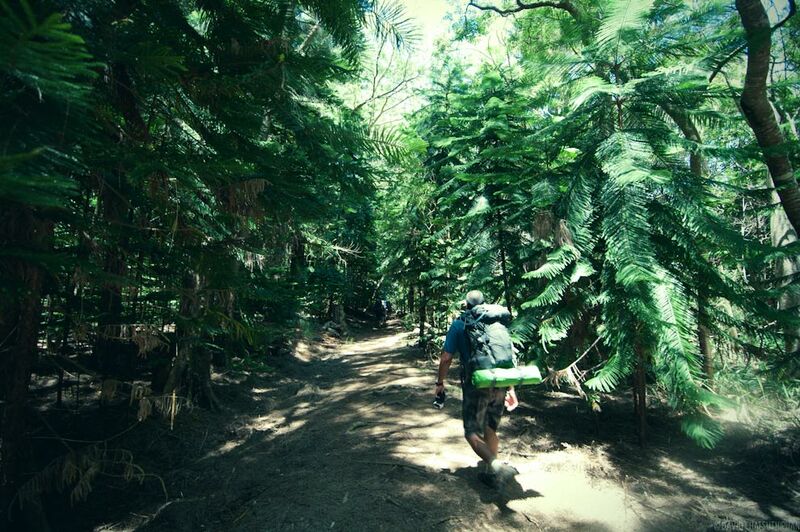 As it turns out, the 9 mile hike from Waipio Valley to Waimanu Valley wasn’t all that bad. But, the return hike … now that was a different story. And I’ll discuss that in a later post. Just like on our Kalalau trip, we caught the first flight out. 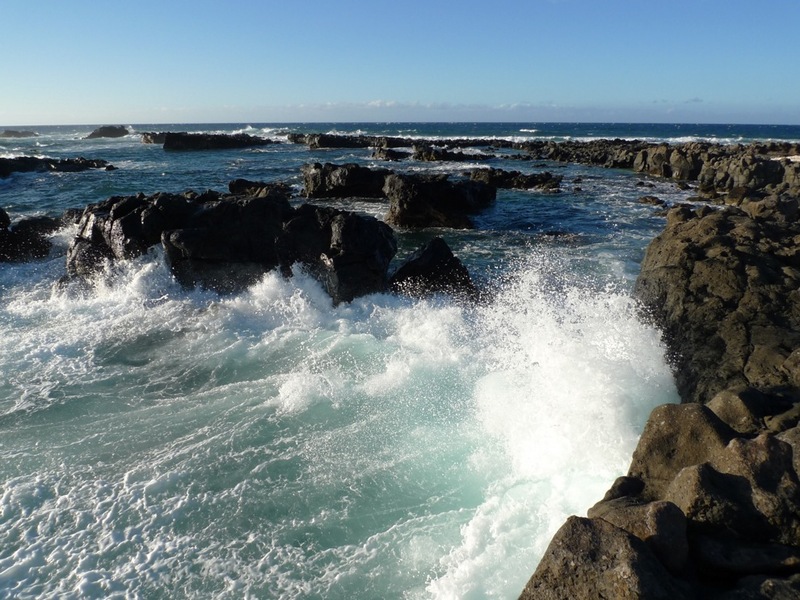 You’ll want to fly in to Hilo as it’s a shorter drive to Waipio Valley than the Kona airport. 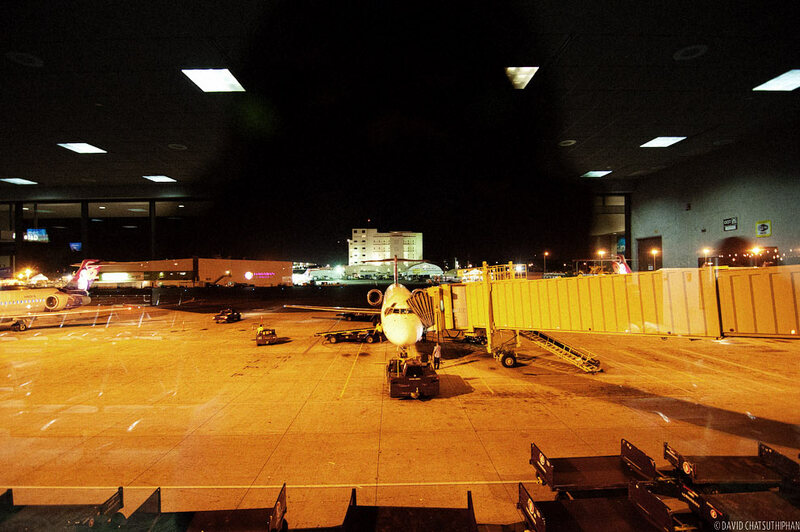 First flights to the Big Island are at 5am. You don’t get much sleep but at least you don’t need to fork up for a hotel the night before. 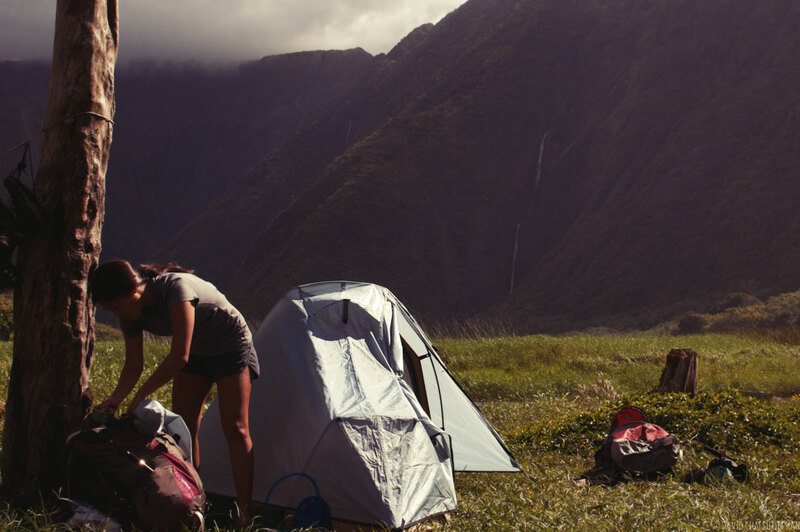 You don’t necessarily need to leave this early by the way, but the earlier you go, the sooner you’ll be in Waimanu. 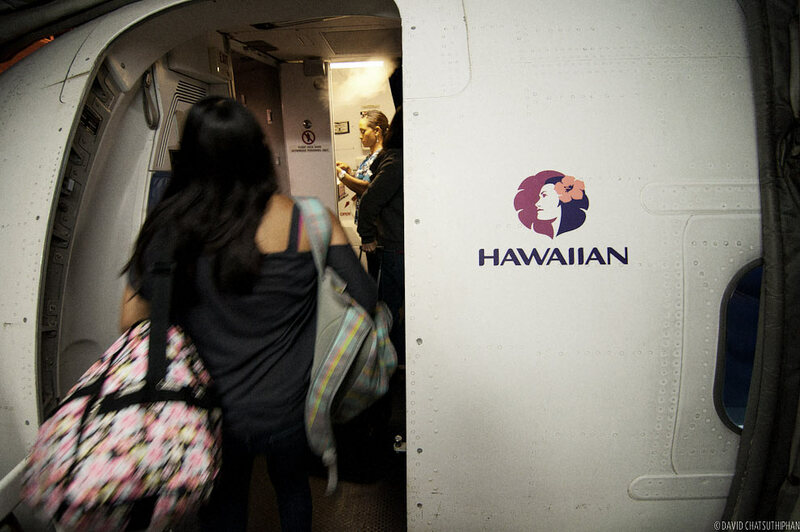 I typically fly Hawaiian. Rates were the cheapest and they have flights every hour. 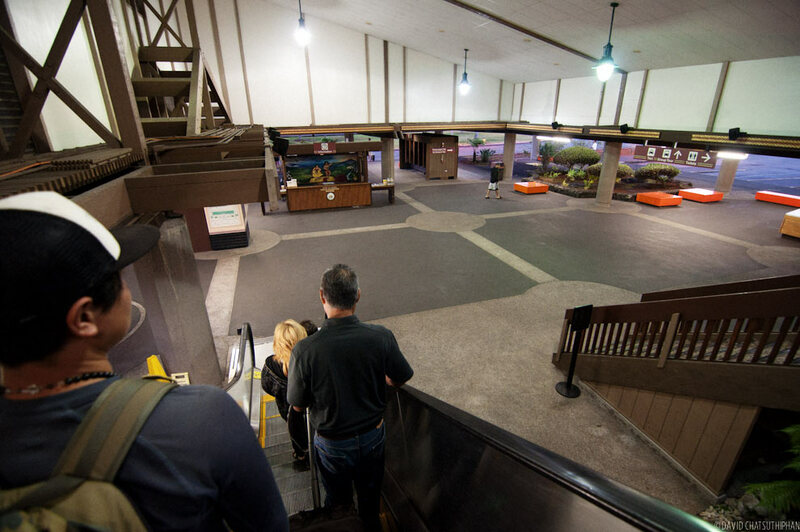 When you arrive on the Big Island, right when you get off the plane, you immediately feel that relaxed feeling. It’s like stepping back into simpler times. Which, I know, sounds weird being that I live in Hawaii … but it’s all relative. 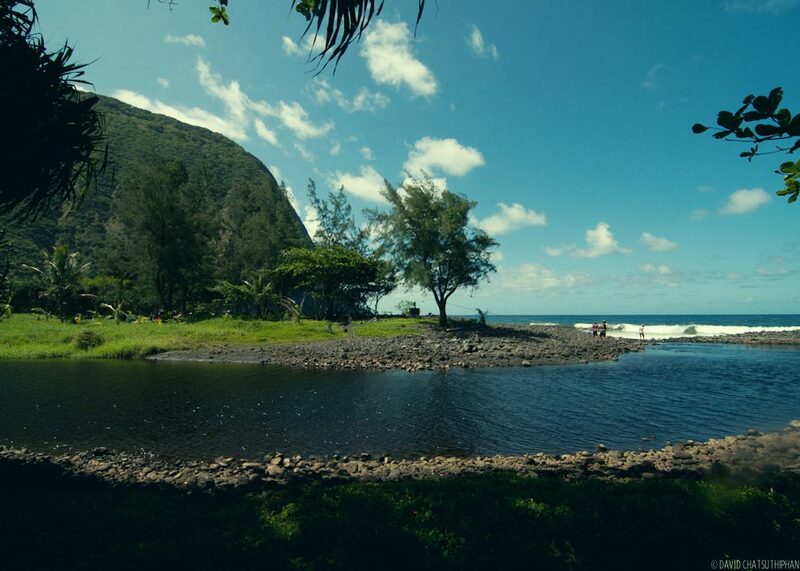 You’ll need a rental car to drive to Waipio. 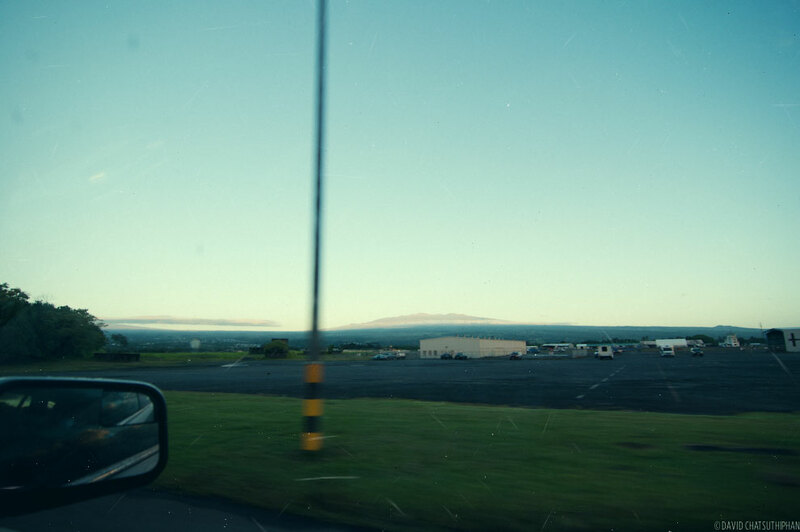 The drive to Waipio from the airport takes just under an hour and a half. You’ll probably want more time to pick up breakfast, water and any last minute supplies. 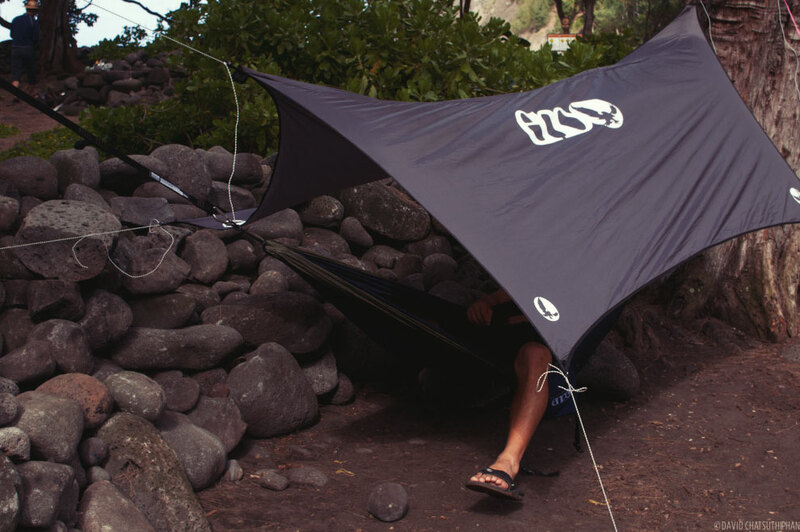 You can do this at a 7-11 in Hilo or at a market closer to Waipio. But, for that hour on the road in between, you won’t see any stores. Just homes and beautiful scenery. 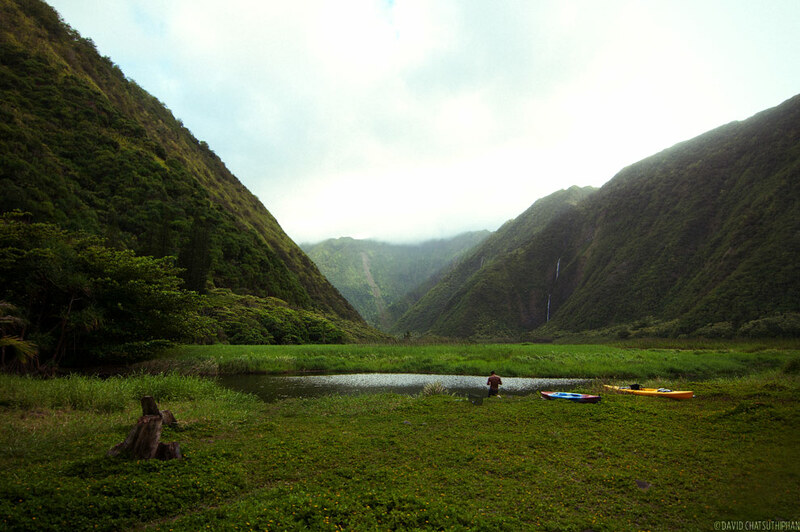 There’s overnight parking available at Waipio Valley Artworks for an affordable nightly rate. I paid $15 a night. We had agreed to meet Kaleo, Brian, Ryan and Lei here at 9. 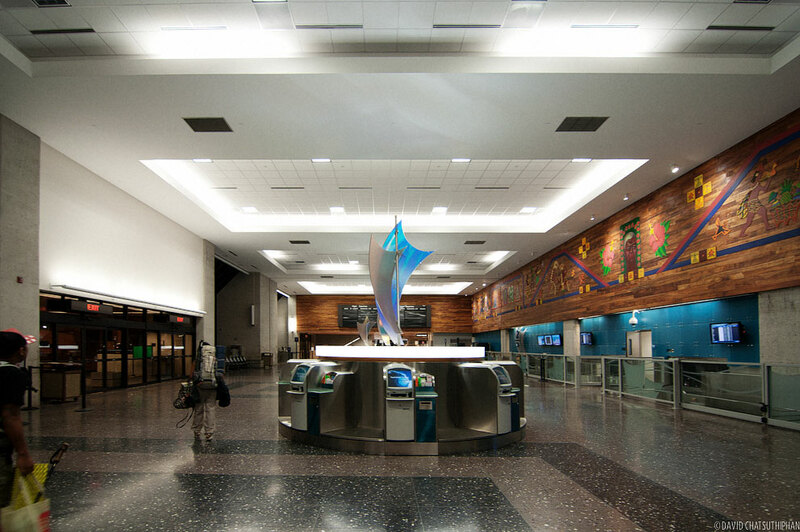 Here’s an important tip: if you plan on meeting anyone here, arrange it before hand and be on time. There’s no cell phone signal within a few mile radius of here. 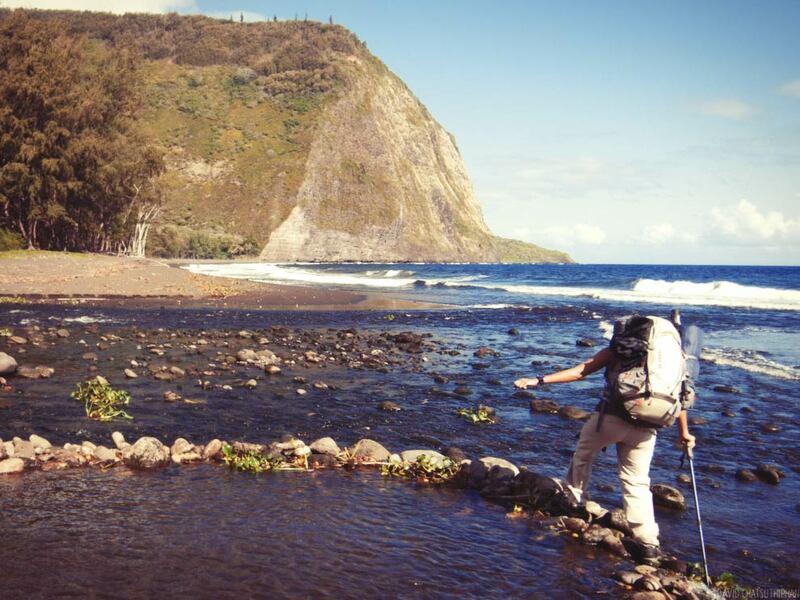 From Waipio Valley Artworks, Kaleo let us hitch a ride to Waipio (about a 15-20 minute walk) and then all they way down Waipio Valley Road. 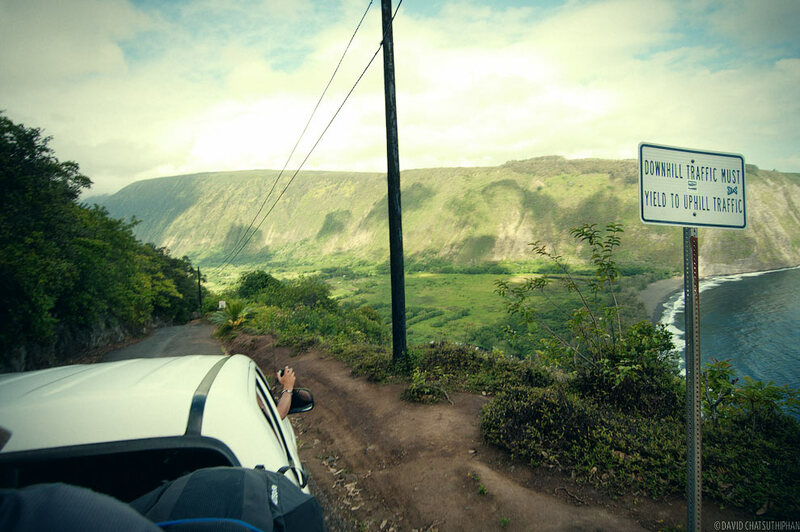 Supposedly, if Waipio Valley Road were classified as an official road, it would be the steepest road in America. 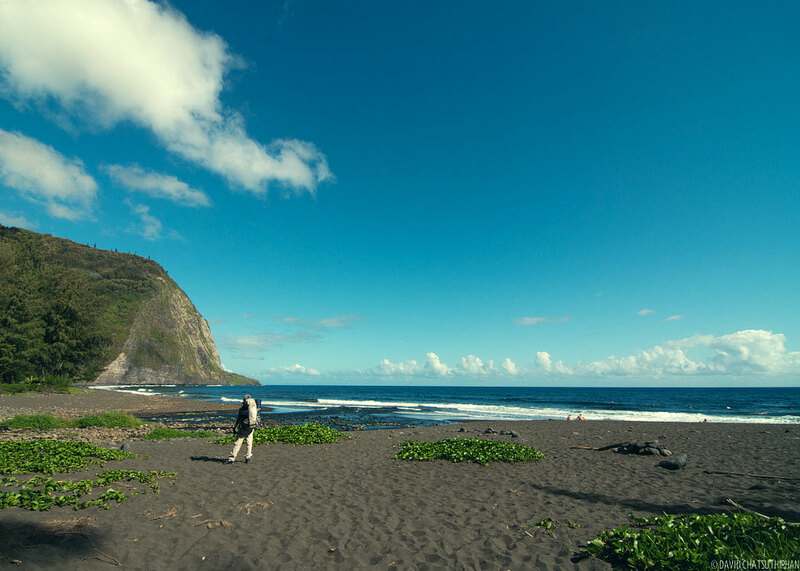 We got dropped off right on the beach in Waipio Valley. If you make this trip, I hope you are dropped off the same place we were because I think that alone reduces the difficulty level of this hike by a few notches. But right after you gear up at the beach, you’re faced with your first obstacle. 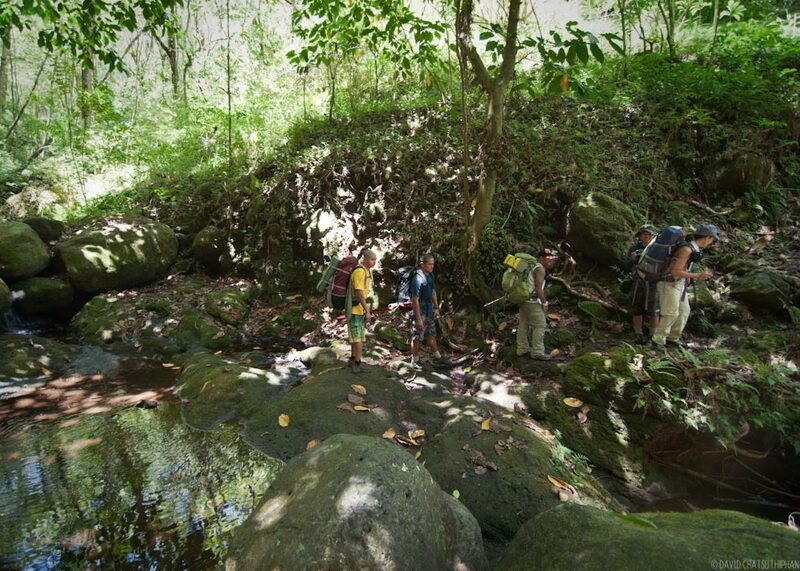 A huge stream crossing across Waipio Valley Stream. Don’t take this crossing lightly. The flow of water is strong and the rocks are slippery. One slip and all your gear could get wet. I choose to follow Ryan (above) and cross close to where the water flows into the ocean. You’ll cross a wider area but the water is shallower. And, I kept my boots on as I’d rather have wet socks than a wet pack. Some others crossed over the rocks slightly further up stream. 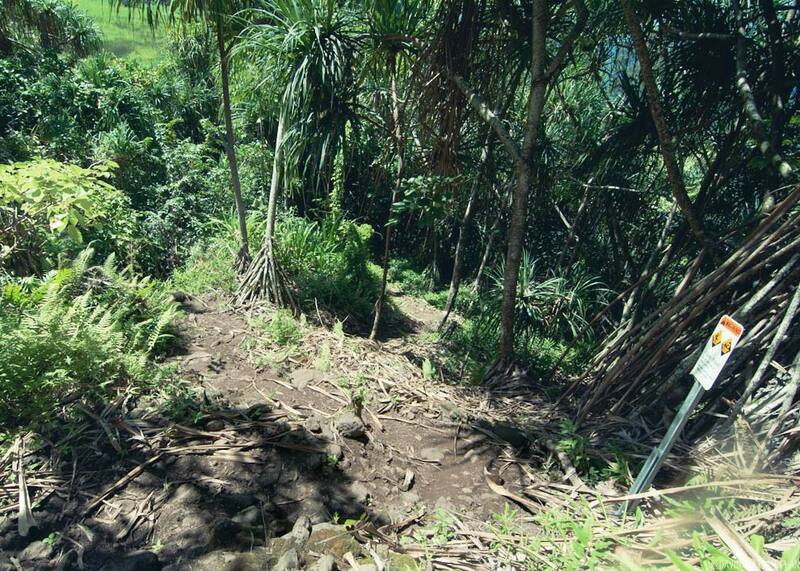 From here you can see the first section of the Muliwai Trail, the imfamous “Z-Trail”. 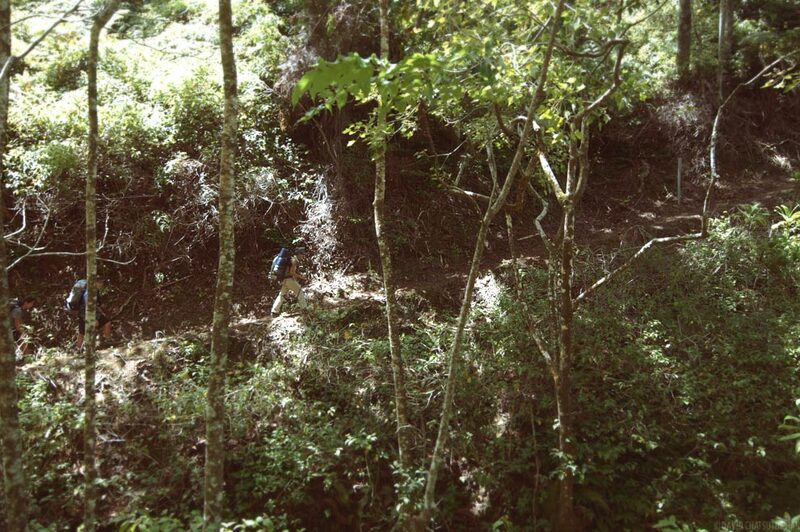 If you look at the cliff in the picture above you can make out a faint zigzag that goes up the valley wall. The trail is a series of steep switchbacks and hiking up it with a pack on is a hell of a way to start the morning. But the good news is, you’ll get the hardest part of the hike out of the way right from the start. 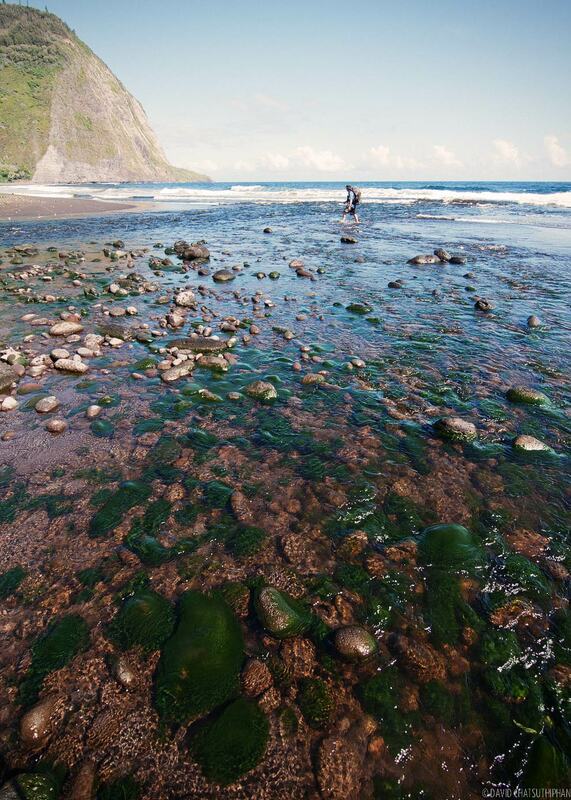 Once you get through the stream you’ll hike, with squishy boots, across the Waipio Valley. 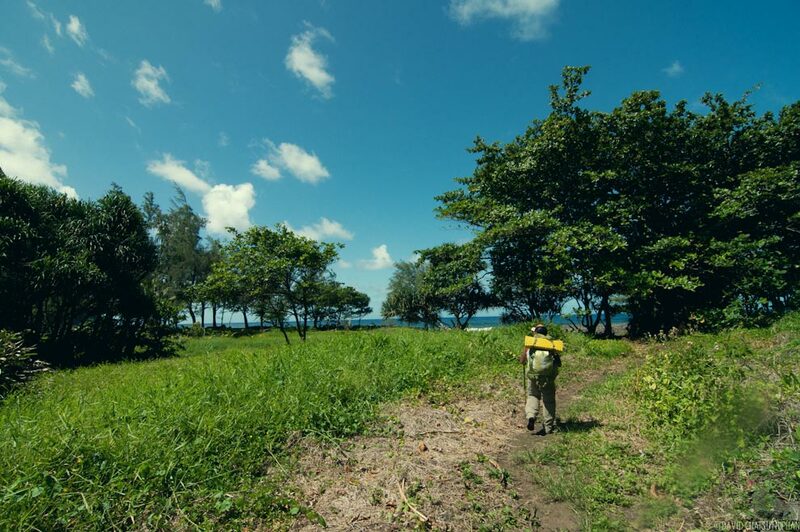 This is the Muliwai trailhead and the start of the Z-Trail. Half of the group beasted up it and half (the half I was in) took it slow. This trail is tough but don’t be intimidated by it’s reputation. If you take plenty breaks, you’ll get through it eventually. 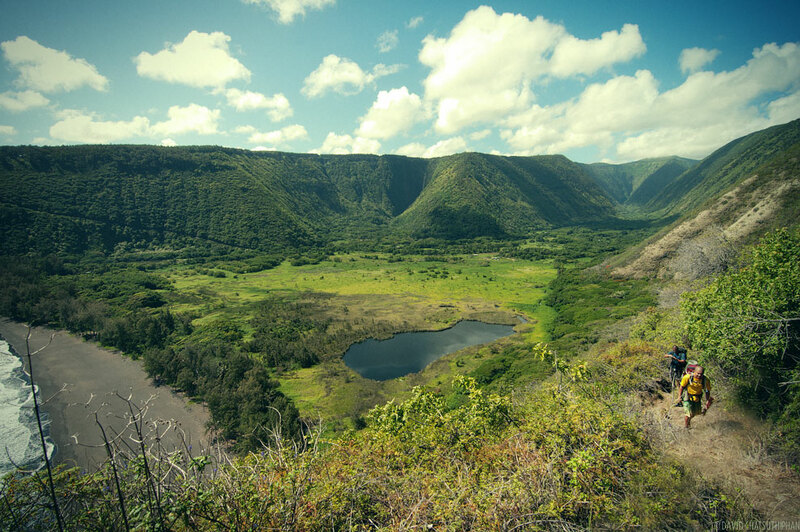 Half way up the Z-Trail you get amazing views of Waipio Valley. 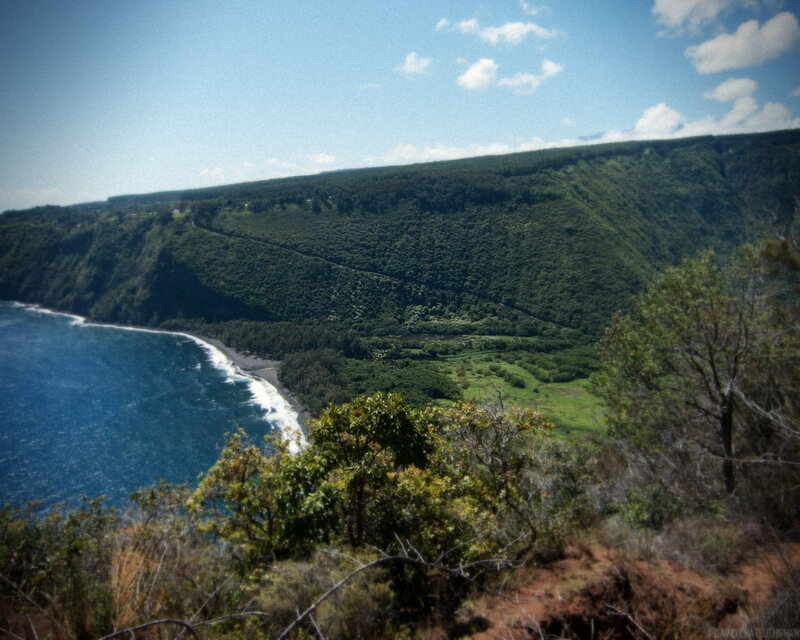 From here you can see the steep Waipio Valley Road. You can see the steepness of the switchbacks here. You gain about 1200 feet elevation going up the switchbacks. After about an hour we were at the top. We rejoined the faster hikers of our group at the top. The crew for this trip was Justin, Cory, Reanne, Kaleo, Lei, Brian and Ryan. It was time for a much needed break. I was drenched with sweat already and needed some Gatorade and a Cliff Bar to recharge. And then it was time to hit the trail. This section of the trek does not feel like Hawaii. 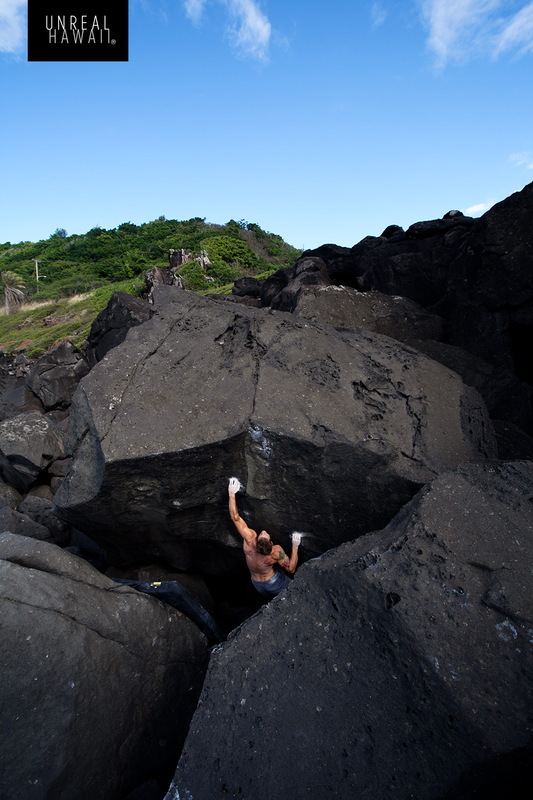 It resembles Kuliouou on Oahu. 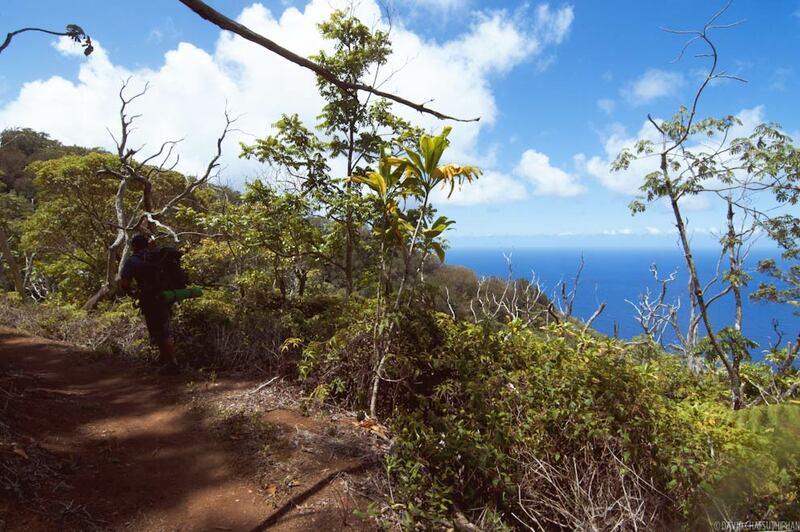 Beyond the Z-Trail, the Muliwai Trail will take you 8 more miles in and out of valleys and gorges. You’ll cross 13 streams in total. 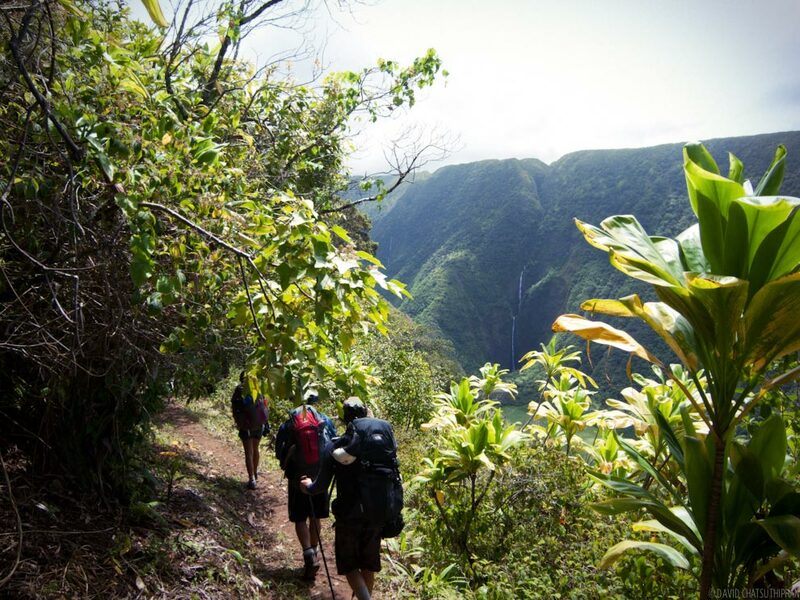 It sounds grueling but after doing Kalalau, the hike in to Waimanu didn’t feel to bad. Of course, a heavy pack changes everything. Brian sucked it up and brought his fishing pole and gear even though it would mean carrying a heavier pack. I think this is the right mentality. 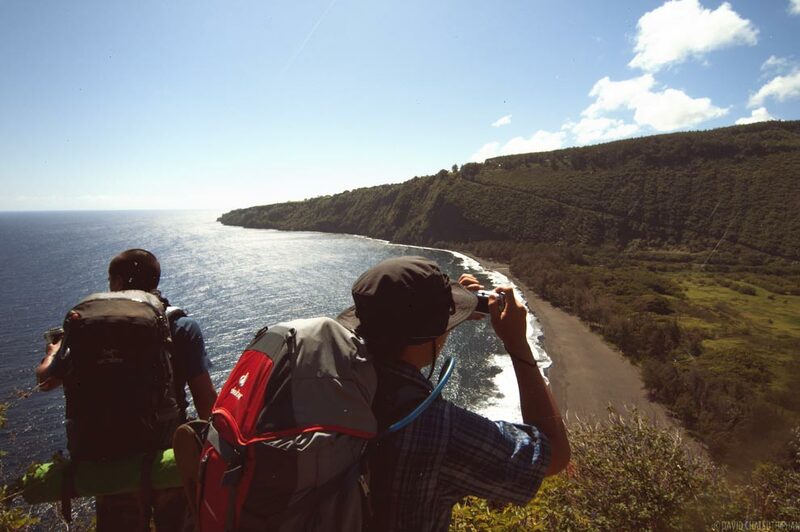 You don’t get to go on trips like these that often, so when you do, you might as well make the most of it. The terrain changed from forest to jungle. And then back to forest. There are only a few sections where you have a nice ocean view so soak it in when you get a chance. This is one of the last switchbacks. 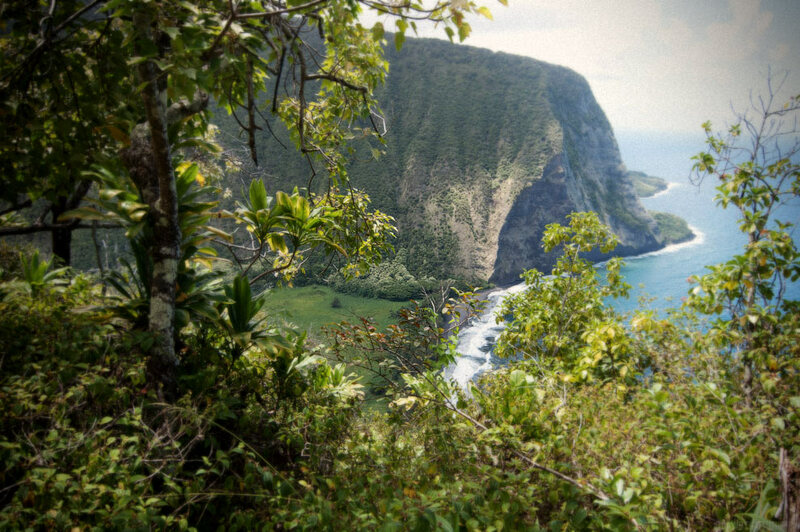 When we hiked around the bend and just a little bit further down the coast we could finally see our destination, Waimanu Valley. And the beautiful Wai’ilikahi Falls. Now you descend into the valley. 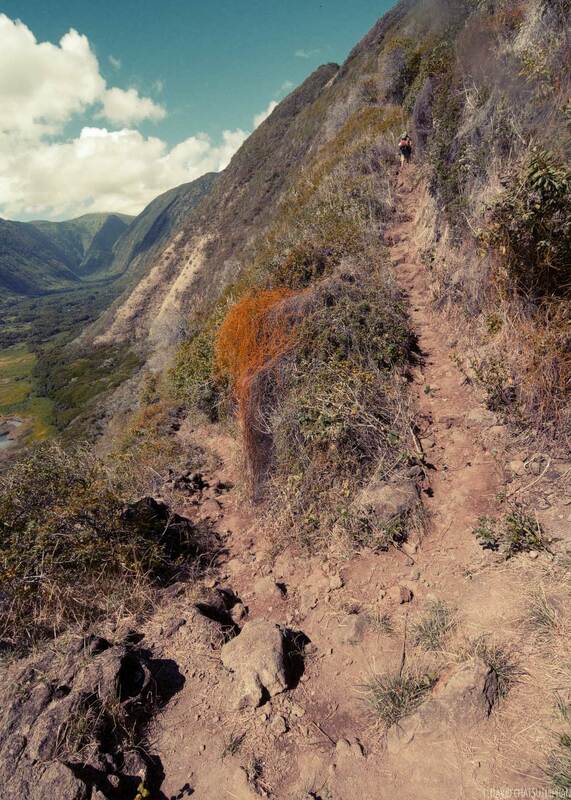 This set of switchbacks is steeper and the Z-Trail and the trail is more rugged. As you hike down it, it hard not to think about how difficult it’s going to be to hike back up when it’s time to go home. And let me tell you, it’s hard. Like, really hard. More difficult than the Z-Trail. But don’t worry, for now just be happy that you’ve arrived at your destination. 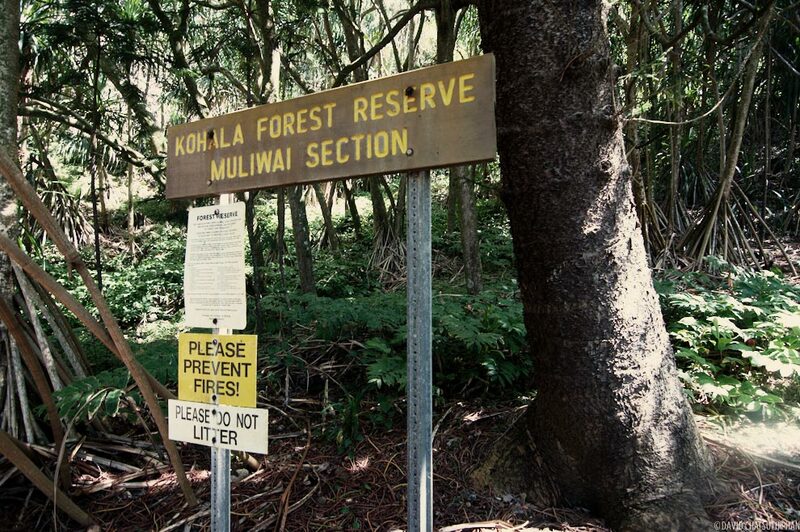 This trailhead sign for the return hike lets you know you’ve reached the end of the Muliwai Trail. Once we arrived we set up camp. This is campsite #2. 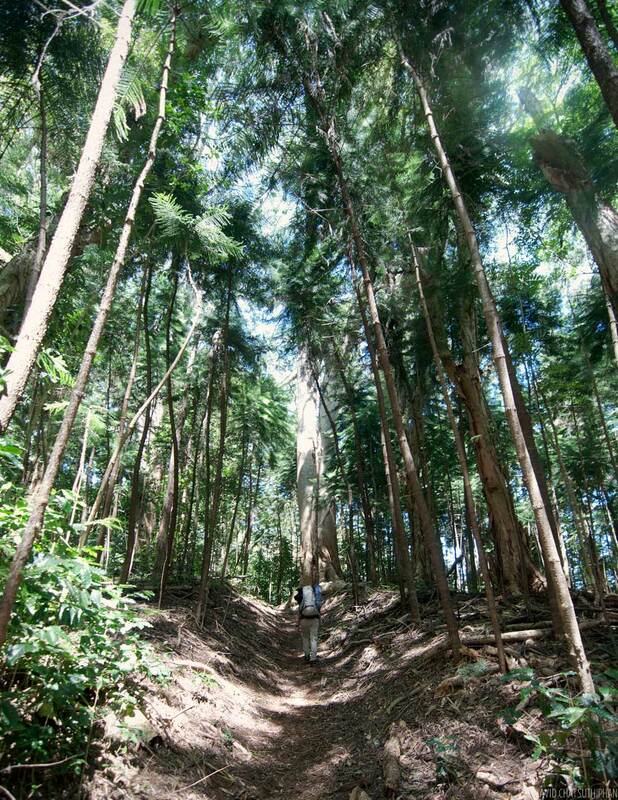 It’s one of the larger ones and has an unobstructed view of Waimanu Valley. When we arrived the campsite was already occupied. But when we talked to the folks there they said they actually had a different campsite reserved but someone had taken it. There’s no one around to help you resolve permit reservation issues so you just have to hope that the people you run into are cool enough to not take your spot, or move when you show up. The group that had our spot was super nice and moved to a different spot for us. 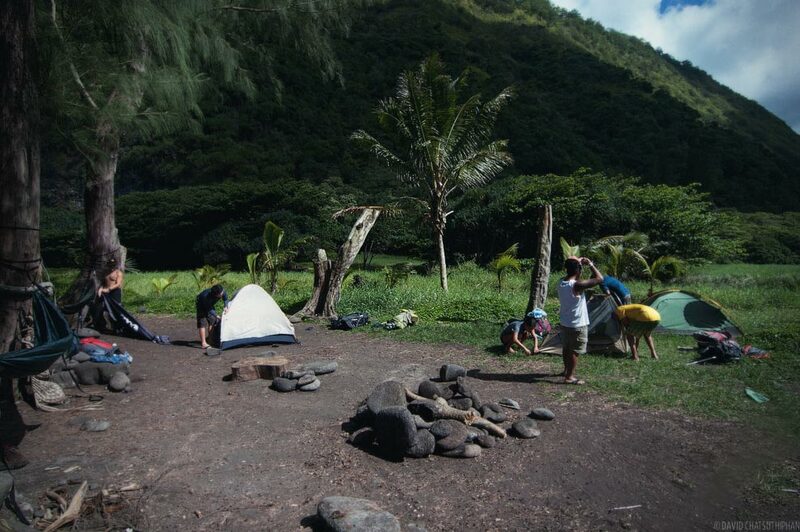 Brian, Kaleo and Reanne and I took one side of the campsite. Ryan brought a hammock with a rain cover instead of a tent. Lei picked a spot with a prime view. We had camp set up in about an hour and would need to find water and start cooking dinner soon. With the hike pau, we could start to enjoy the valley. The hike took us just under 6 hours. 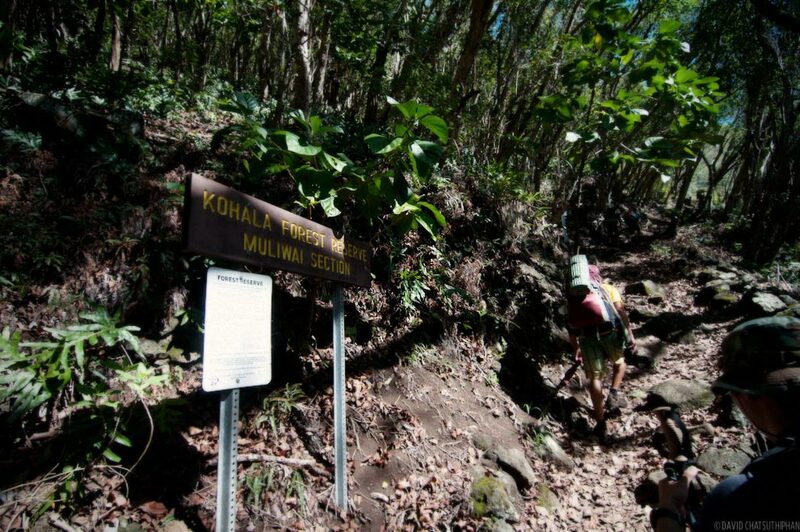 This trail is known as the most difficult backpacking trail in Hawaii. 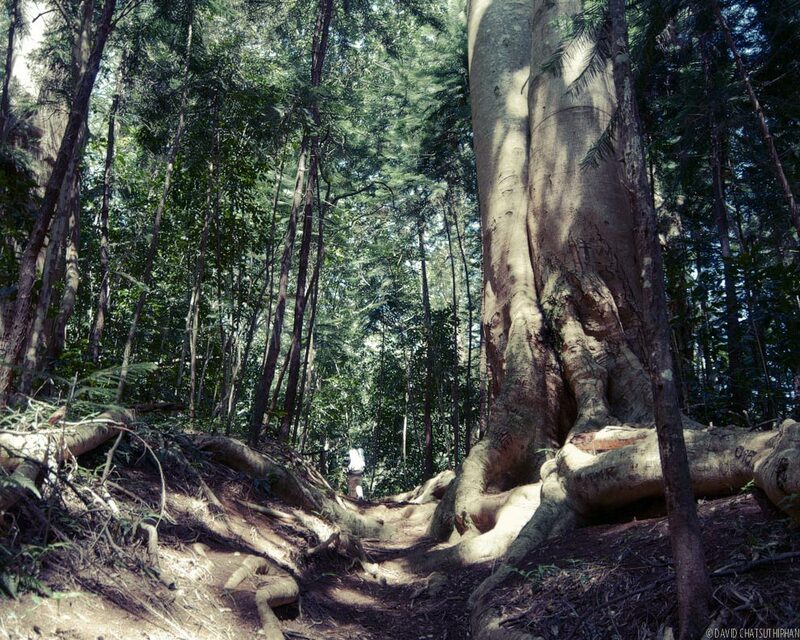 It’s very hard, but if you’re an experienced hiker, don’t be intimidated. It’s doable. 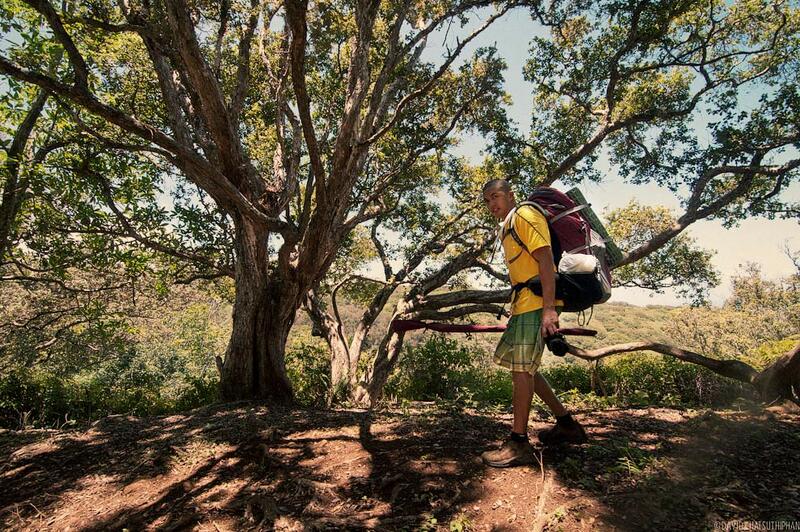 Trekking poles are mandatory in my opinion. They let you use your arms to support the weight of your pack. 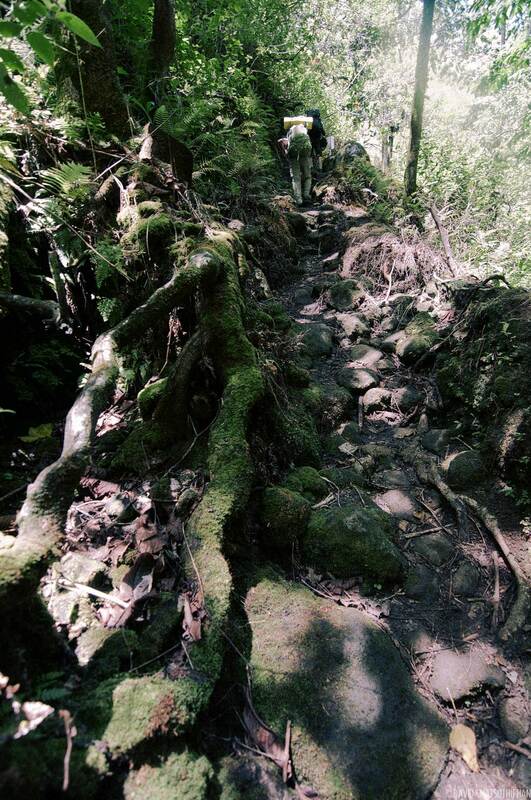 Hiking boots will be more comfortable than hiking shoes as there trail can be very rocky in parts. 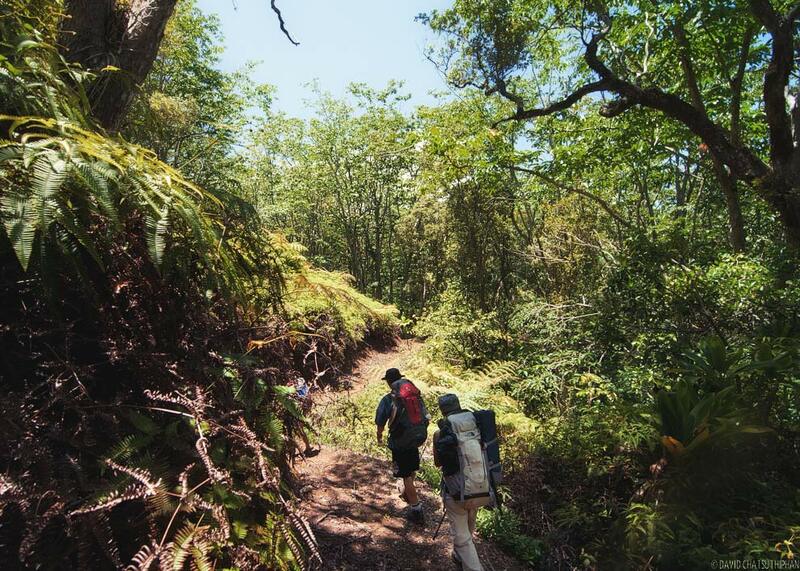 Remember, there’s no cell phone signal for most of the hike and in Waimanu Valley. Camping here is by permit only. You can request a permit here. 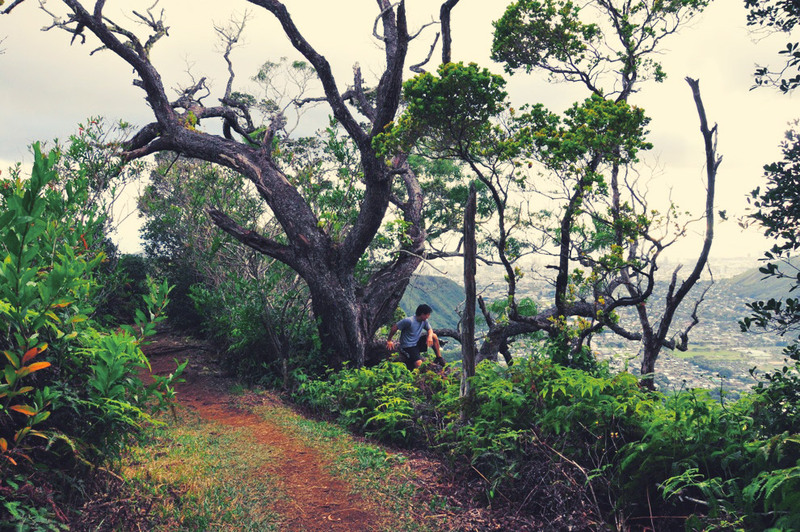 Nate Yuen’s write up on this hike (we found Nate’s Hawaiian Forest blog to be a valuable resource in preparing for this trip). 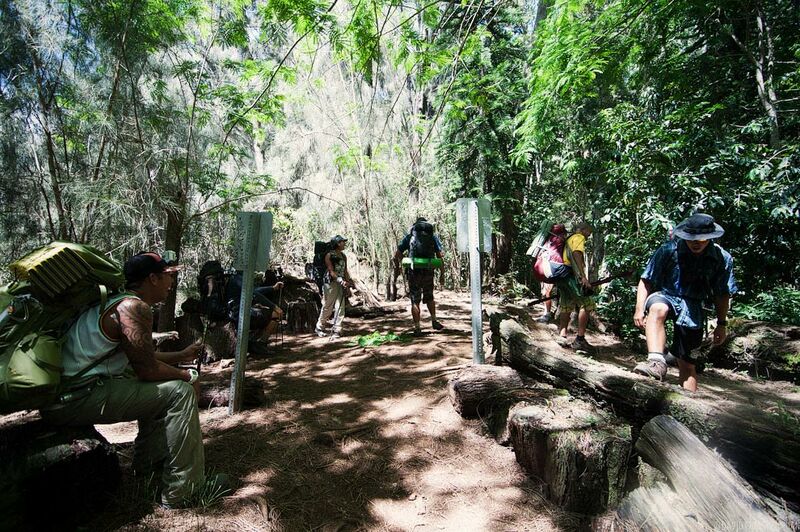 The official Na Ala Hele page for the Muliwai Trail. 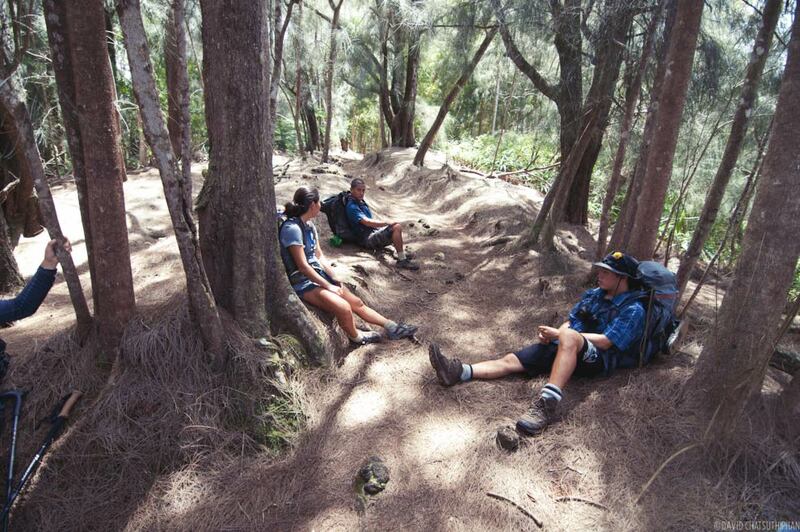 Write up and nice trail map on GuideOfHawaii.